The Pilgrimess is the ghost of Isabella Smith; During colonial times, Isabella Smith sailed across the Atlantic Ocean to New England in search of a better life. But as the tight-knit townsfolk didn't trust outsiders, Isabella became isolated from the rest of the town. When the town's livestock began to die mysteriously shortly after her arrival, Isabella was accused by the local preacher of witchcraft. She denied the claim, but then the preacher fell ill, and the town quickly turned against her. They cornered Isabella in a barn, which they lit on fire, but she emerged completely unscathed. 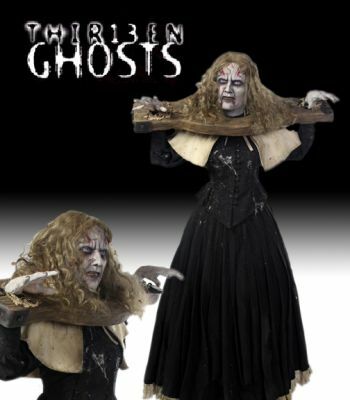 This is a complete display of the "The Pilgrimess" (Shawna Loyer) from the 2001 movie "Thir13en Ghosts", and consists of her screen used complete outfit. It was made to recreate the character from the film production, and is an amazing display piece of a truly memorable character.